Can you post a picture of the motor now as there are various vintages of 9C motors. Just to be clear, the Tidalforce S750 is not the folding version of the bike. It's a hardtail with a front suspension. Yo McKitterick. You got an early Christmas present! LOL. That's GREAT NEWS! I'm so glad. Did you mean that you bought it on December 20th, 2017? Posting an itemized list with prices would help you sell much faster and with less effort. Also, if you leave it on for a long time, it will be difficult to remove. The adhesive turns into a solid and unless you want to scrape it off, it can be challenging to get off. I've tried alcohol, acetone, Goof-Off water, etc. with no luck. It's still great stuff though. Brand new in box! If you can find it cheaper and available I will try to match or beat that price!!! The big red flag warning for me is the immediate charge to your credit card without any indication of when it would be shipped. WARNING, WARNING! Justin and Anne-Sophie made the news! There are screws on the back, however, the unit is advertised as being water proof. There are ports on the top of the case for voltage and current control covered by rubber plugs. Got mine. Looks new as promised. Thanks. Good thing ebikes.ca sells this! Yup. I remember the Voloci bikes were originally marketed under the Nova Cruz name which was Xootr's original manufacturer, I believe. 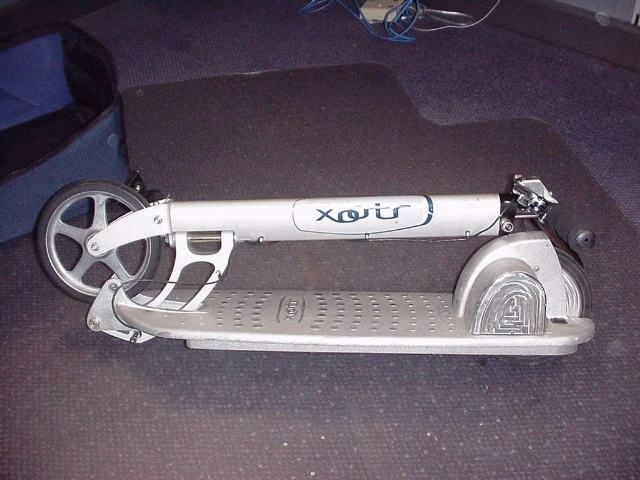 I used to love the Xootr EX3 electric scooter. I never had one but wanted one badly! Where are you located and are you willing to ship the bikes or other components? Re: Tidalforce M750X for sale. Shipping on that would be challenging. Can you ship to Washington, DC area? BusyTreeMan, where are you located? It would also be VERY helpful to post some clear overall and close-up photos of your bike. If it’s in good shape and had a working battery, I would say about $1,000 USD. HOWEVER, without a working battery, I would say around $500. It doesn’t cost a lot to put a 16AH battery on it and get great range and power from this pioneering bike.